Ease of use, structure, consistency and engagement is the essence of what the Snapshotz tool delivers. Once the Snapshotz license is purchased a login with user name and password is received and the process of assessment can commence. Snapshotz makes the preparation, planning and execution process easy. The simple easy to read reports are also designed to make the next steps intuitive and simple to follow. 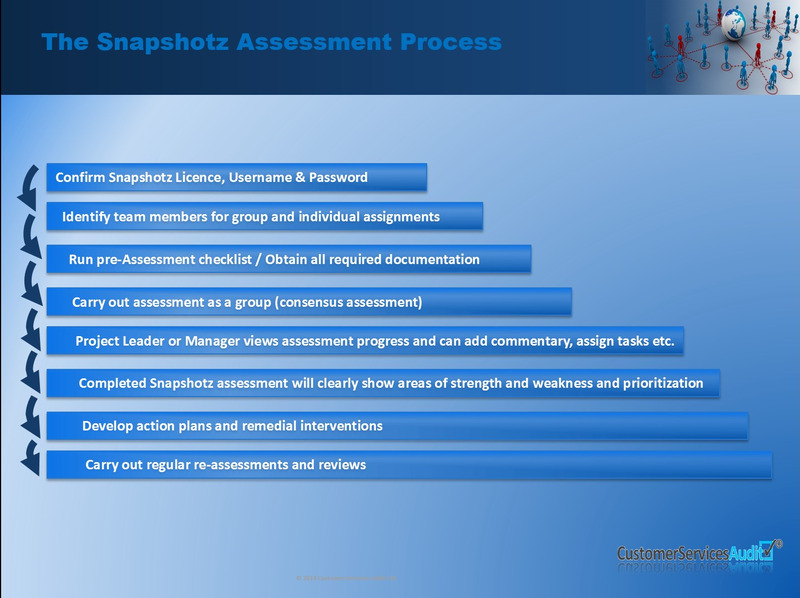 Prior to the assessment process commencing Snapshotz makes the preparation and planning process easy. The pre assessment checklist, a five minute task, prepares the way for information requirements and their availability. As a pre assessment step the Snapshotz tool has the ability to assign sections for up to 5 team members for review. Even if you run a 3 – 5 man customer interaction centre there is between 350 to 700+ variables you would need to review to perform a robust assessment. Snapshotz makes execution easy by providing a simple layout with assessment questions and descriptions making the assessment easy to follow and understand. Flexibility of timing for completing the Assessment. Operational management are always time short. Unforeseen events often disrupt schedules and Snapshotz online is designed for flexibility by enabling the completion of the assessment over a 8 week period, once you login and register to start the online assessment. Tracking progress of assessment made easy. When 1 or more sites are involved Snapshotz makes it easy to track progress on each assessment as well as multiples of assessments at one glance of the assessment dashboard. When conducting the assessment, the Snapshotz tool has the functionality to assign tasks to team members or others. When the assignment is being done, a priority and date for completion can be assigned to the assignee along with a detailed task description. The Snapshotz tool has the functionality to either send out task requests immediately or at an appropriate point in time as determined by the project leader and team. A task management report can be generated both in spreadsheet and pdf format enabling a single view of tasks developed by the assessment. All data entered into the Snapshotz tool is encrypted prior to transfer to the Snapshotz master data repository. Only the nominated administrator at the time of purchase will receive a login and password. As a further precaution reports can only be generated or seen by members nominated by the administrator. The administrator controls which team member or person has access to the assessments and can withdraw rights at any time. The administrator also controls who can access and view the final reports. There are a suite of reports that are downloadable when the assessment is complete. Note there are 8 compulsory sections of the 29 sections that need to be completed before reports are downloadable.